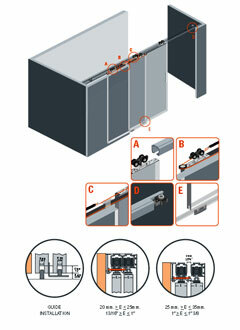 Top sliding system for wood or aluminum doors installed inlay the opening and traveling in bypass. Doors will open, synchronized, in the same direction with only one movement. Door width up to 2060mm (6.7 ft). Two systems installed one at each end of the opening will provide a max span of 8.2m (26.8 ft).